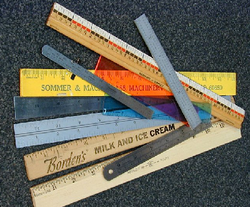 Cool Video-"Every measurement you make"
I Can convert units of measure within the U.S. Customary system.I Can choose an appropriate unit of measure within the U.S. Customary system. I can solve real-world problems. I can measure lengths to the nearest eighth of an inch. I can find the perimeter of polygons. How do I read a ruler? How do I read a ruler (2)? Everyone knows how to use a ruler, right?